7 Day Christmas sale offers toys, bikes, TVs, home electronics, Christmas trees, treats, cosmetics, phones, kitchen and serving ware, and kids' clothing products. 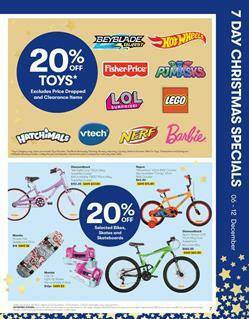 You can buy toys for 20% less with the catalogue deal. Also, 20% discount on bikes. Go to pg 7 for these products. Diamondback Men's mason 27.5" bike will cost only $263.20! The deals are effective on 6 - 12 December. Viano 55" UHD TV provides a decent experience of watching modern cinema movies. 4 HDMI inputs mean it can connect to your home theatre system, PlayStation, Blu-Ray player and maybe a computer at the same time. It also has a recorder. This TV can display 1.06 Billion colours. Compared to Polaroid 31.6" TV which is 720p, this TV is far superior. However, the other one is much cheaper with a price of $199. Christmas trees are on sale. Pay only half for the excellent decoration and Christmas treats including Lindt, Cadbury and more brands. Phones like Telstra Nokia 2.1 or Laser 10" quad core tablet are also in the Christmas selection of the new Big W Catalogues. There are also interesting and outstanding products like Navig8r full HD action camera. You can renew your garden with a nice gazebo which is only $149. Save $50 on that product.